This month, the east Indian state of Tamil has experienced serious flooding, with the heaviest rainfall seen in almost 100 years. Since the heavy rain began on 12th November, the state capital of Chennai has been brought to a standstill, with 188 deaths reported and 1000s of people having been driven from their homes. Chennai Airport has closed, leaving over 400 people stranded and more than a dozen trains have been cancelled after flood waters covered the tracks. Schools and colleges are now approaching their third week of closure since November and nearly 60% of the city's neighbourhoods are living without power. In Chennai's southern suburbs - the worst-affected area of the city - the army and National Disaster Response Force have been deployed to rescue those still stranded in their flooded homes. 4 helicopters have flown over the city dropping food, water and medicines while fishing boats manned by members of the Indian military collected stranded residents. A larger relief effort involving 5,000 soldiers is now planned. 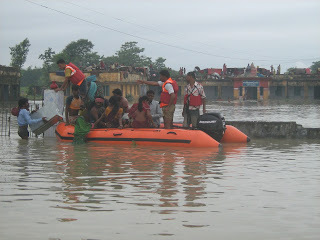 Each year from June-September the annual monsoon rains bring severe floods to India, however, according to weather experts, the extreme weather has been amplified this year by El Nino, a warming of the eastern Pacific Ocean that can have can have a significant climatic impact. Over the past few years, the number of El Nino events has increased, however, experts are yet to reach a consensus on whether a true link exists between the weather phenomenon and global warming. Indian Prime Minister Narendra Modi has blamed climate change for the extreme conditions in Chennai, emphasising the importance of the upcoming global climate change talks in Paris and exposing the vulnerability of tropical countries such as India when it comes to extreme weather. While researchers are yet to prove conclusively that humans are having an impact on the frequency of natural disasters like El Nino, this is certainly likely to be the case and the recent events in India should provide a strong reminder to us all of the need to take urgent action in the fight against climate change. The initiative should come from first world countries, who should use the Paris Climate Change Summit to make a commitment to reduce greenhouse gas emissions and further embrace forms of renewable heat and power sources.